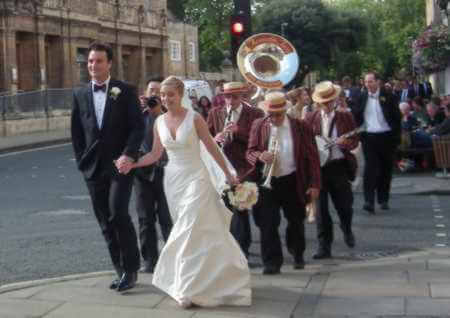 A Traditional Jazz Band For Wedding Receptions Ideas. Jazz band hire for your jazz themed wedding. If you want a unique wedding with a jazz theme or just nice friendly music, in a hotel or, a village fete setting in a field, it would be a good idea to hire this wedding jazz band for the guest's entertainment on your fun wedding day. 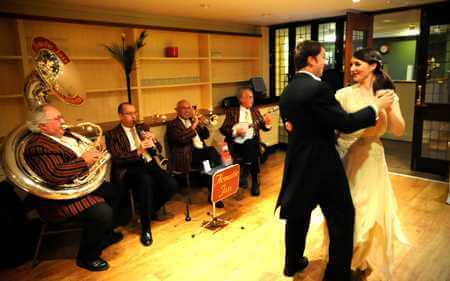 These musicians are available to help any bride and groom make their special day go with a swing to be that bit more special. These accomplished wedding entertainers will play a mixture of jazz standards, ballads and vintage nineteen twenties pop songs that have a beginning, middle and end, entertainment which people of all ages like. Live music at Leyton and Rebekah's jazz themed Wedding. The new Husband and Wife walking from their Wedding Ceremony to the reception, taking the entertainment with them. The musicians in this band are professional performers that have featured in over four hundred peoples wedding plans throughout Hampshire, Dorset, Wiltshire, Berkshire, Surrey and Sussex in the south of England, UK. If the happy couple would like this band to play a special tune not currently in their repertoire they will learn it for you (provided it fits their style!) and, unusually for jazz bands they have some waltzes in their repertoire making this one of the best entertainment ideas that you could have. In addition to their nineteen twenties style striped blazers, evoking the Great Gatsby era, seen in most of the pictures Acoustic Jass have white tie and tails for the formal wedding theme.